Yale’s Climate and History Initiative is a collaborative effort to explore the relationship between climate, ecology, and the historical evolution of societies, institutions, and economies. 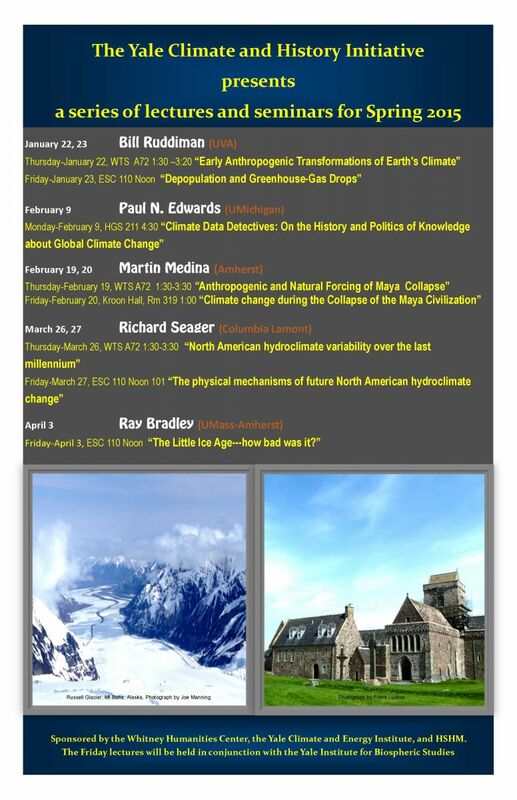 Launched during the 2014-2015 academic year with support from Yale’s Whitney Humanities Center and the Yale Climate and Energy Institute, the Climate and History Initiative encourages collaborative research and learning among historians, social scientists, and natural scientists to examine the relationship between history and climate. Key questions being explored by faculty members in the group include: How can academics in the humanities and social sciences sort through the enormous amount of climate science that has been generated in the last ten years? How does this data map onto the historical record? How has human society adapted and responded to climate and ecological change in the past, and how might it in the present and future?